Philadelphia is one of my favorite places in the world to visit. 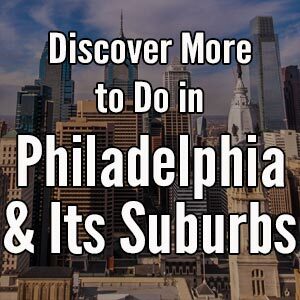 And, while there are many great tours, historical sites, and museums in Philly that cost money, there are also a ton of great things to do for free! When I’m planning my trips to Philadelphia, I’ve found that there isn’t a complete list of free things to do in Philly. Some sites list a handful of free activities, while others pad their list with a few “cheap” things to do. 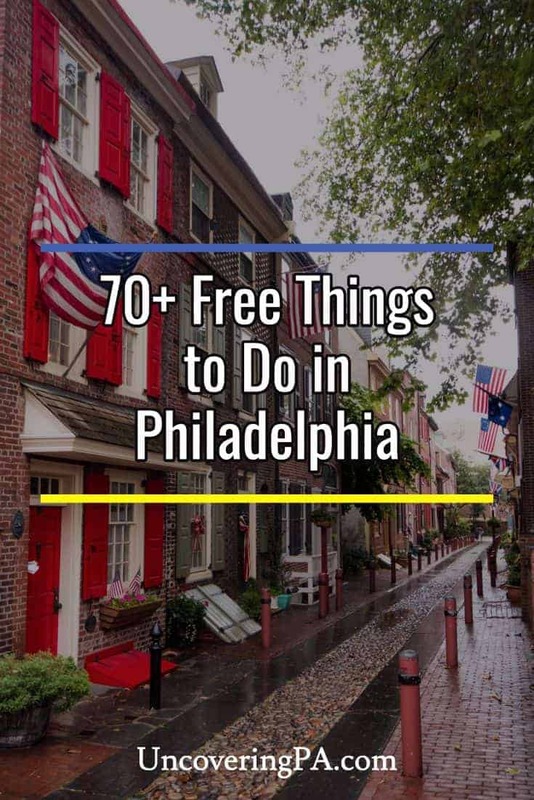 However, this list that I have made up has more than 70 completely free things to do in Philadelphia. Look below for fun things to do in Philadelphia for couples, unusual things to do in Philadelphia, things to do in Philadelphia at night, and more. 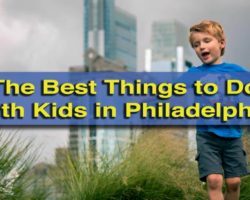 So, whether you are looking for a free museum, a free outdoor activity, or free things to do with kids in Philly, there’s something for everyone on our list. Independence Hall – Not only is Independence Hall one of Philly’s most well-known buildings, but it’s completely free to visit! 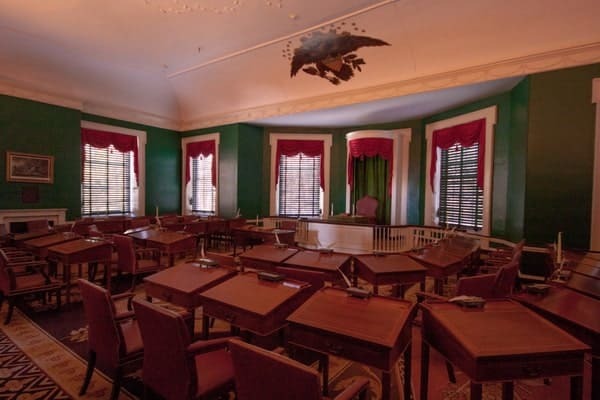 Tour the building and learn about the Founding Fathers who once roamed its halls and the Declaration of Independence which was agreed to in this very building. Find out more about visiting on UncoveringPA. Free Tours of the Kimmel Center – The Kimmel Center is one of Philadelphia’s most well-known and beautiful concert venues. If you want to learn a bit more about the history and architecture of the building, the Kimmel Center offers free tours of the building everyday at 1pm. Tours last one hour and include visits to many of the theaters inside the center. More information can be found here. John Heinz National Wildlife Refuge at Tinicum – Philly might be one of America’s largest cities, but that doesn’t mean it doesn’t have several excellent outdoor spaces. Located near Philadelphia International Airport, this wildlife refuge is an oasis in the midst of urban sprawl for more than 300 bird species, as well as numerous mammals and reptiles. For human visitors, 10 miles of hiking trails, great bird watching, and even canoeing/kayak opportunities await. For more information, check out our article on hiking at the John Heinz National Wildlife Refuge. Mount Moriah Cemetery – At one point in time, Mount Moriah Cemetery was ownerless and abandoned. However, with more than 80,000 people buried here, this couldn’t last forever. While there is a cleanup effort underway at the cemetery, much of it is still being reclaimed by nature. 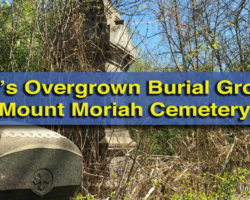 Click here to find out more about how you can visit Mount Moriah Cemetery. 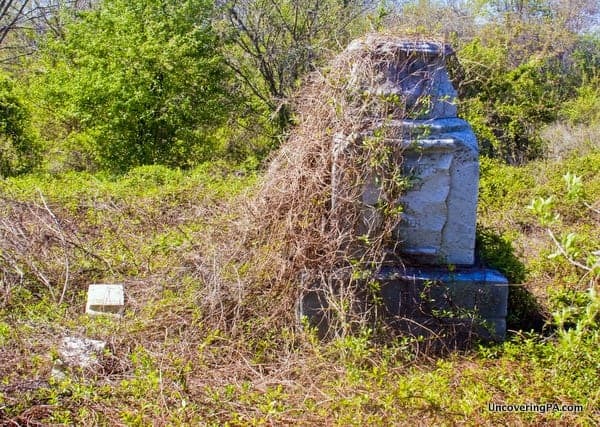 An overgrown grave in Mount Moriah Cemetery. Student Recitals at the Curtis Institute of Music – Don’t let the thought of going to a student recital remind you of some horrid concert for elementary students. The student recitals at the Curtis Institute of Music are put on by some of the country’s most talented music students. Featuring primarily classical music, the recitals are a great option for those looking for high-quality music on the cheap. Concerts are held most Monday, Wednesday, and Friday nights during the school year. Click here for a full schedule. Edgar Allan Poe House – Did you know that author Edgar Allan Poe spent six of his most productive writing years in downtown Philadelphia? Tour the home where he lived during his time in the city. Poe actually lived in several homes during his time in Philly, which is often described as the happiest years of his life, but only one building remains standing. Visit this home to learn about Poe’s life, writing, and legacy. Click the link for more information. Dream Garden – One of Philadelphia’s coolest public art pieces is shamefully under-visited despite being just a block from Independence Hall. Crafted of over 100,000 pieces of Tiffany Glass, the Dream Garden sits in obscurity in the lobby of the Curtis Center along Washington Square. At 15×49 feet, the Dream Garden is one of America’s most exquisite glass murals. More information about visiting the Dream Garden can be found here. The Dream Garden in the lobby of the Curtis Center. The Mummers Museum – The Mummers are one of Philly’s strangest traditions. Part social club and part performing artists, the Mummers put on a show every New Years’ Day. You can learn more about their history and legacy at the fantastic Mummers Museum in South Philly. This museum is definitely one of the most offbeat free things to do in Philadelphia. Find out more in our full article about the museum. Ice Skating at a Public Skating Rink – Like ice skating and have your own skates? Visit one of the city’s many public ice skating rinks during the winter months and skate ’til your heart’s content without paying a penny (If you don’t have ice skates, there is a fee to rent them. However, skating on the rink itself is completely free). For more information on skating in Philadelphia, click here. Fireman’s Hall Museum – Located in a restored turn-of-the-century fire hall, the Fireman’s Hall Museum focuses on the rich history of firefighting in Philadelphia. Click the link for more information about visiting. 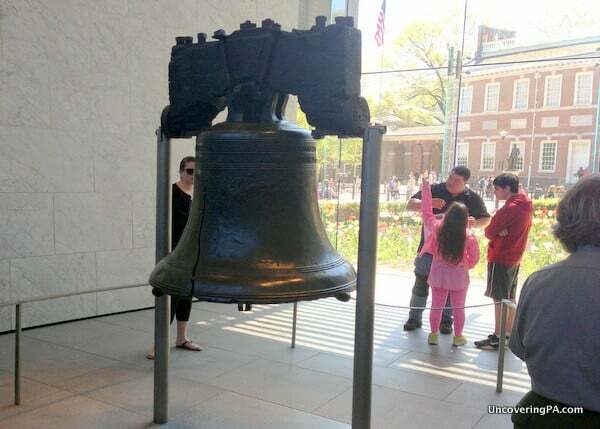 Liberty Bell – Located next door to Independence Hall might be Philly’s most famous item: the Liberty Bell. While it once hung in the bell tower of Independence Hall, it now has a place of honor inside its own building. Stepping inside to see this iconic bell is completely free for anyone. Click here to find out more about visiting. Visiting the Liberty Bell is completely free. 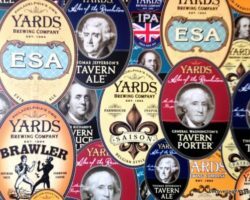 Tours of Philadelphia Brewing Company – Want to learn how beer is made? Tours of the Philadelphia Brewing Company are offered for free on Saturdays between noon and 3pm. Visit to learn about the brewery and sample some of their great brews (unfortunately not free). Click here for information. Awbury Arboretum – Once the home to a large Quaker family, the 55-acre grounds of the Awbury Arboretum have been opened free to the public for nearly 100 years. Stroll through the beautifully manicured gardens or take some time to study the large variety of shrubs and trees on the arboretum’s grounds. 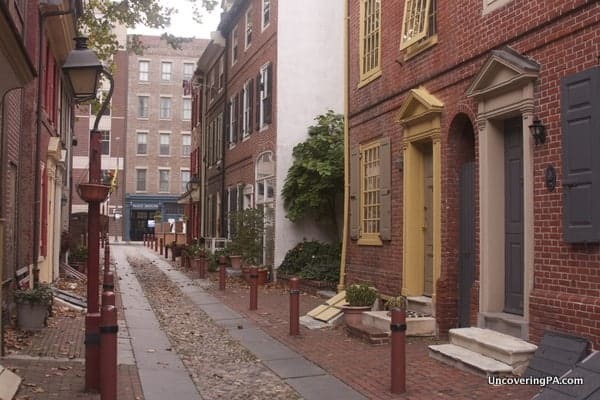 Elfreth’s Alley – As America’s oldest, continually-inhabited residential street, Elfreth’s Alley already has an amazing amount of history along its narrow cobblestone street. While the street itself might be short, the beauty of the houses and its history make it a great destination for any history lovers visiting Philly. Click here for my full review of Elfreth’s Alley. Cira Green – Cira Green is one of the most unique parks in the region. Located on the roof of a parking garage, 95 feet above the ground, this urban oasis is an amazing place to visit. Enjoy a picnic on the grass or enjoy breathtaking views of the skyline of Philadelphia from this amazing free space. Find out more about Cira Green here. Smith Memorial Playground and Playhouse – Located in a purpose-built mansion and surrounding park, Smith Memorial Playground and Playhouse looks like one of the most amazing play areas for children anywhere. If you have kids in Philadelphia, this is a must-visit destination. Click here to read more about this great park. Carpenter’s Hall – Carpenter’s Hall is one of Philadelphia’s most historic buildings. The site of the First Continental Congress in 1774, a Revolutionary War hospital, the 1st and 2nd banks of America, and Benjamin Franklin’s first library, Carpenter’s Hall has more history than most buildings twice its age. 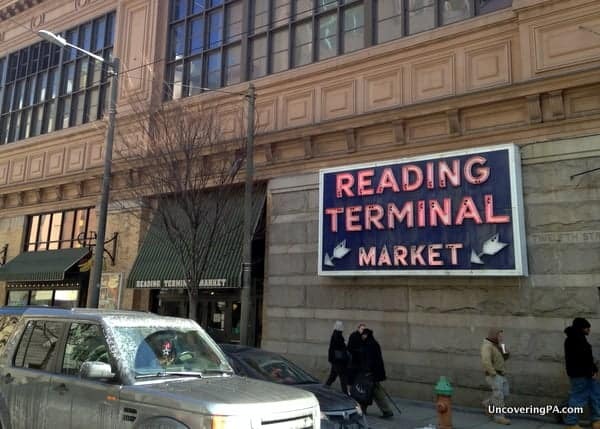 Reading Terminal Market – If you’re looking for a unique shopping experience in downtown Philadelphia, look no further than Reading Terminal Market. Home to everything from Amish produce stands to authentic Asian cuisine, the market has something for everyone. True, it costs money to buy something from the shops and restaurants, but wandering through and experiencing the sights and smells of the market is completely free. A visit to the Reading Terminal Market gives you the sights and smells of the city for free. Jefferson’s Walking Tour of Philadelphia – Want to know more about the places that Thomas Jefferson frequented while he lived in Philadelphia? Check out this great free walking tour put together by the American Philosophical Society. Get some exercise and check out some of Jefferson’s favorite haunts at the same time. Click here to download the walking tour guide. Ellen Phillips Samuel Memorial Sculpture Garden – The Ellen Phillips Samuel Memorial Sculpture Garden features 17 sculptures that showcase American life. The garden in itself is definitely worth visiting, however, it also has one more feature that is sure to intrigue: a whispering bench. Sit two people on opposite sides of the bench, roughly 50 feet apart, and they can hear each other whisper. 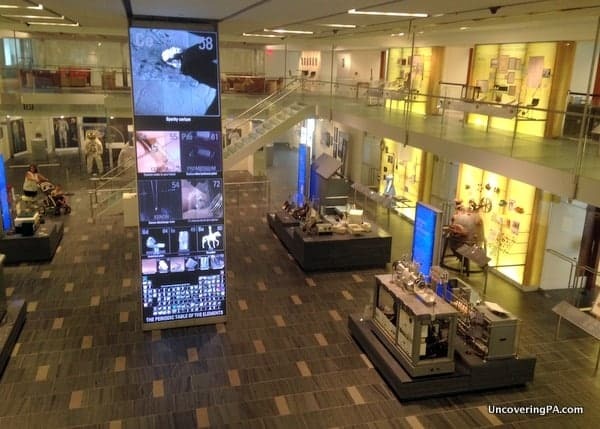 Science History Institute – Located in the heart of Philadelphia’s Old City, the Science History Institute (formally known as the Chemical Heritage Foundation Museum) looks not at the history of America, but at the history of chemistry. Going back to the days of alchemy, the museum looks at how chemistry and the work of chemists have changed our lives. Click here for my full review of the museum. The interior of the Science History Institute. Institute of Contemporary Art – This gallery that featured Andy Warhol’s first solo museum exhibition, so you never know what future megastar you might encounter at the Institute of Contemporary Art. 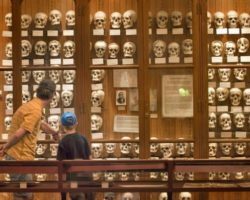 Located on the grounds of the University of Pennsylvania, the museum features 12 shows a year, so there is always something new to see in their rotating display. Information about what’s currently on display can be found on the museum’s website. TUSPM Shoe Museum – Run by the Temple School of Podiatric Medicine, the TUSPM Shoe Museum features hundreds of pairs of shoes from every conceivable era and interest. Shoes on display date back as far as Ancient Egypt, and there are many shoes from famous celebrities including Reggie Jackson, Ella Fitzgerald, Joan Rivers, and several former presidents and first ladies. Admission to the museum is free, but needs to be scheduled in advance. Go to their website for more information. Congress Hall – Another of the fantastic historical buildings in downtown Philly, Congress Hall was where the House of Representatives and the Senate met from 1790-1800. Site of the inauguration of two Presidents, along with many other events that shaped the founding on the country, Congress Hall is a fantastic and free thing to do in Philadelphia. Click here for information about visiting. Congress Hall was the site of many important events in early American history. Polish American Cultural Center Museum – Whether you are a Polish American, or you just happen to be interested in the subject, the museum at the Polish American Cultural Center gives you the opportunity to learn about Polish culture and its history. For more information about visiting, check out their website. Sedgley Woods Disc Golf Course – One of the oldest existing disc golf courses in the country, Sedgley Woods is a 27-hole course located in Fairmount Park. While you must provide your own discs, the course is completely free to play. Click here for more information. Rocky Steps – The 72 steps at the entrance to the Philadelphia Museum of Art was made famous by Sylvester Stalone in the movie Rocky. 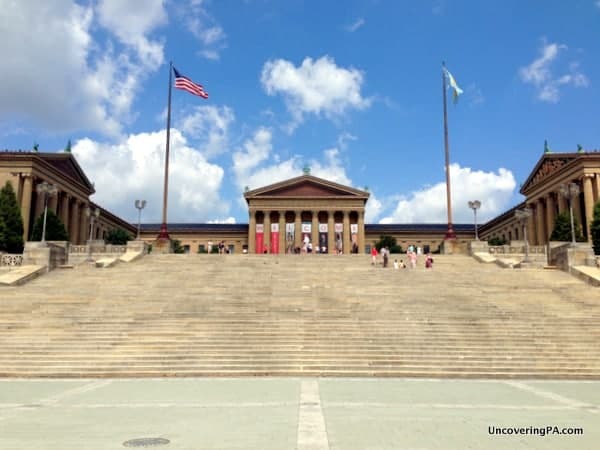 Today, thousands of people visit the steps each year to recreate Rocky’s famous run. Before leaving, make sure to get a photo with the statue of Rocky near the bottom of the stairs. Running up the famous Rocky Steps is a popular activity for both young and old. 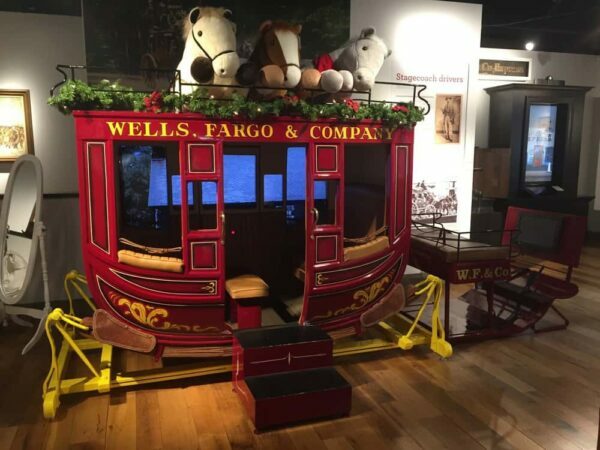 Wells Fargo Museum – Housed adjacent to a bank branch, the Wells Forgo Museum is one of the most interesting free museums in Philly. Visitors can see artifacts from the company’s past as a Pony Express courier and learn what life was like for those delivering mail and goods in the Old West. Find out more about visiting on the museum’s website. Ryerss Museum – The Ryerss Museum is housed in a former mansion that was built in the 1860s on the outskirts of the city. Today, it is home to a fantastic collection of Asian and European art, Native American objects, and a vast collection of paintings of the family that used to live in the home, as well as their pets. Find out more in our piece about the Ryerss Museum. Public Art of Isaiah Zagar – While Isaiah Zagar’s most well-known work, the Magic Gardens, isn’t free, the artist has also created dozens of murals, both large and small, around the city that are free to visit. You can find out their location on the Magic Garden’s website. The Wells Fargo Museum is one of the best free museums in Philadelphia. Self-Guided Mural Mile Tour – In an effort to combat graffiti in Philadelphia, the city began what would later be known as the Mural Arts Program in 1984. Since then, over 3,600 murals have been painted all throughout the city of Philadelphia. Spend some time learning about some of them by taking the self-guided walking tour of the “Mural Mile” from the Mural Arts Program. Click here to download the tour and find out more. Fabric Workshop and Museum – Despite its name, the Fabric Workshop and Museum doesn’t just focus on fabric. Instead, they encourage artists to use new mediums to express themselves. The museum’s collection includes a permanent exhibit of contemporary art as well as preliminary sketches of projects and videos of artists talking about their work. More information about visiting can be found here. 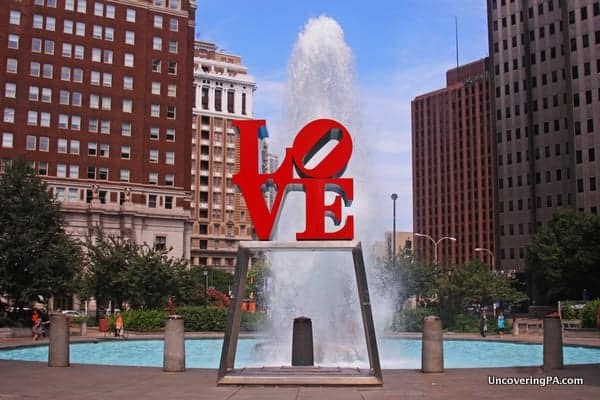 The Love Sign – Outside of a photo with the Rocky Statue, a photo with The Love Sign in Love Park might be the most iconic shot of Philadelphia. The Love “sign” is actually a piece of Pop Art by Robert Indiana. And, while the art piece can be found in other cities around the world, it’s most synonymous with the City of Brotherly Love. Love Park in downtown Philadelphia. Thaddeus Kosciuszko National Memorial – Though not well known today, Thaddeus Kosciuszko was a hero of the American Revolutionary War, as well as a freedom fighter in his home country of Poland. Kosciuszko lived in this home while recovering from injuries received while fighting in Poland. During his time in the house, he was visited by many dignitaries, including Thomas Jefferson. The Thaddeus Kosciuszko National Memorial also has the distinction of being the smallest national park in the country, as well as the fourth-least visited. Click here for more information about visiting. SEPTA Transit Museum – Located in the SEPTA Store at the 13th Street Station, the SEPTA Transit Museum features information about the 100+ year history of public transit in Philadelphia. On display are a rotating selection of model subway engines and rolling stock, as well as information and memorabilia chronicling the history of SEPTA. For more information, go to their website. Christ Church – Opened in 1695, Christ Church was the first Anglican Church in America, and years later, was the birthplace of the US Episcopal Church. 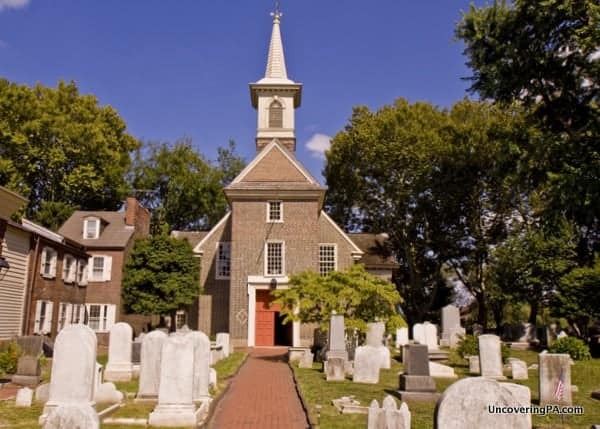 During the time that Philadelphia was our nation’s capital, Christ Church featured a who’s who of founding fathers in their membership and regular attendance. If you visit today, you can still see where George Washington sat during his time as president. Also make sure to find the baptismal fount, which was the same one used to baptize William Penn as a child in England. More information about visiting Christ Church can be found here. 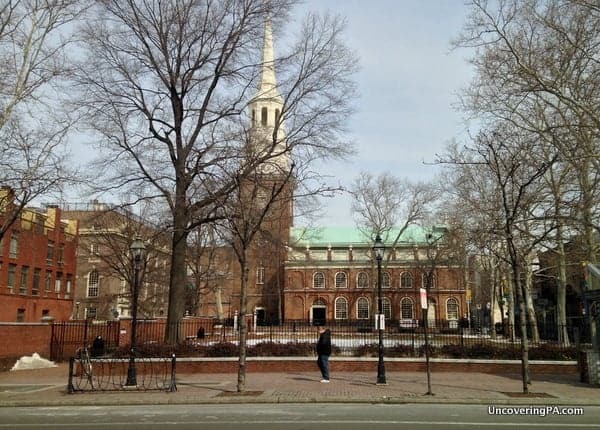 The historic Christ Church in Philadelphia. Once Upon a Nation Storytelling and Reenactments – During the summer months, Once Upon a Nation has storytellers and reenactors stationed at various places around Philadelphia’s Old City that will help history come alive. The storytellers aren’t dressed in period garb, but do sit at various “storytelling benches” around the area telling the stories of less well-known people that shaped history in Philadelphia. The reenactors are stationed at places like the Independence Visitor Center and help bring history to life. For more information and a full schedule, check out their website. Professor Ouch’s Bizarre Bazaar and Odditorium – Located along South Street, this odd shop features a collection of nostalgic and weird things for sale. However, the highlight is their Odditorium, which features sideshow-like pieces such as “big foot’s finger,” a mermaid, a much, much more. Find out more about visiting here. 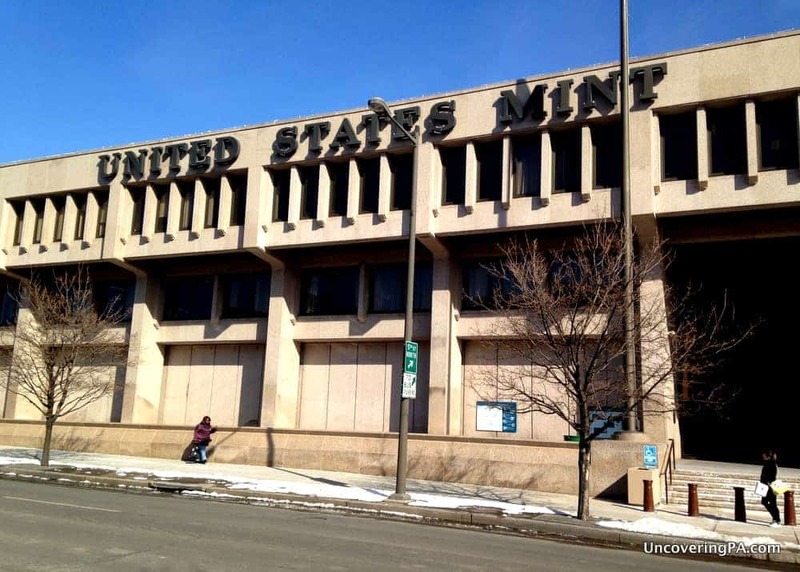 US Mint – Ever wondered where the money in your pocket comes from? A visit to the US Mint in Philadelphia gives you a great chance to see how coins are made. The self-guided tour starts with a bit of history about the US Mint before walking you through the process of making a coin. The highlight is the windows that give you the ability to look down on US coins being made. Click the link for my full review of visiting the US Mint in Philly. Take the free tour at the Philadelphia Mint. Tomb of the Unknown Revolutionary War Soldier – Located in Washington Square near Independence Hall, the Tomb of the Unknown Revolutionary War Soldier honors the many soldiers, both British and American, that are still buried in this park. The memorial was completed in 1957 and features an eternal flame above the grave site. More information on the tomb can be found here. Thomas Mill Covered Bridge – Located in the northwest corner of Philly, in Fairmount Park, is Philadelphia’s only remaining covered bridge. 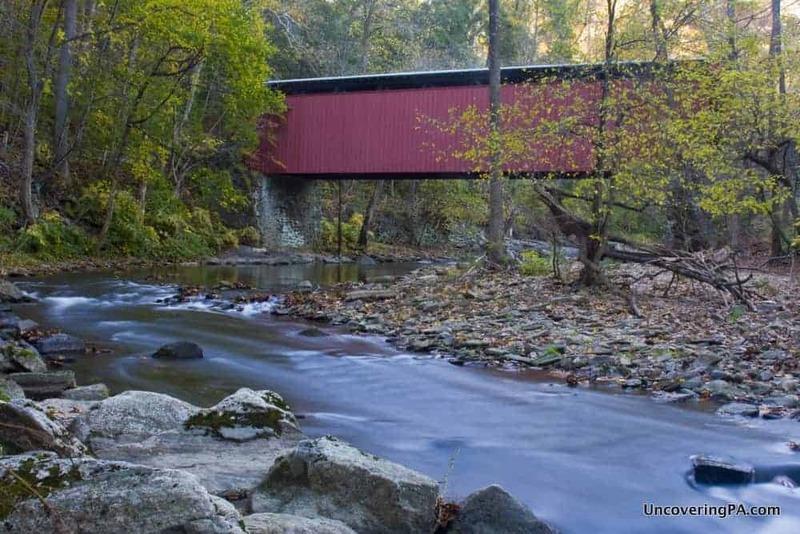 The 86-foot long bridge crosses Wissahocken Creek and is located in a quiet, remote spot of the park. Click for more information about how to get to Thomas Mill Covered Bridge. Free Concerts at the Kimmel Center – The Kimmel Center might be one of Philadelphia’s best performing arts venues, but that doesn’t mean that you can’t see some of their shows for free. Several times a month, the Kimmel Center puts on free shows encompassing many different musical styles and tastes. A full calendar of free concerts can be found here. Hike through Wissahickon Gorge – Wissahickon Gorge is one of the city’s best outdoor areas. Featuring more than 50 miles of trails in the park’s 1800 acres, visitors can truly feel away from the city in this amazing landscape. In addition to hiking, many of the trails are also open to mountain bikers and horses. 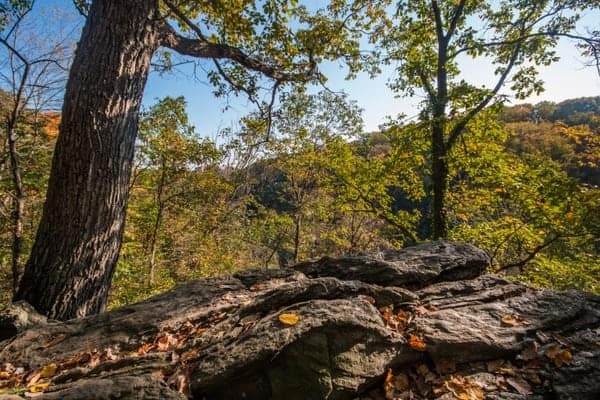 Click the link to find out more about visiting Wissahickon Gorge. Public Swimming Pools – Philly is home to over 70 outdoor swimming pools, all of which are free to swimmers during the summer month. To find out the location of Philly’s free pools, click here. Taller Puertorriqueño – This Latin American cultural center showcases art by Puerto Rican and Latin American artists. Exhibitions change yearly and provide a great look at a little-seen artistic perspective. For more information, visit the center’s website. Beautiful scenery awaits visitors to Wissahickon Gorge. Bartram’s Garden – The 46-acre Bartram’s Garden is the oldest surviving botanical garden in America. Featuring meadows, nurseries, and an arboretum, the garden is a great place to go for a stroll and learn about botany. It’s also a great place to visit to gaze on Philly’s skyline. For more information about visiting, check out our review of Bartram’s Garden. Fairmount Water Works – The Fairmount Water Works were once the most advanced water works in the country. Today, visitors can step inside and explore this beautiful water facility and learn about its history and how it revolutionized Philadelphia. Find out more about their museum on the water works’ website. Take a Stroll Through Chinatown – I was quite surprised when I first discovered that Philadelphia had a Chinatown. Located in Center City near Reading Terminal Market, this heavily Chinese section of the city feels very different from the surrounding neighborhoods. Walking through this section and seeing the sights and sounds of Chinatown can be a fascinating experience for anyone not familiar with Chinese culture. 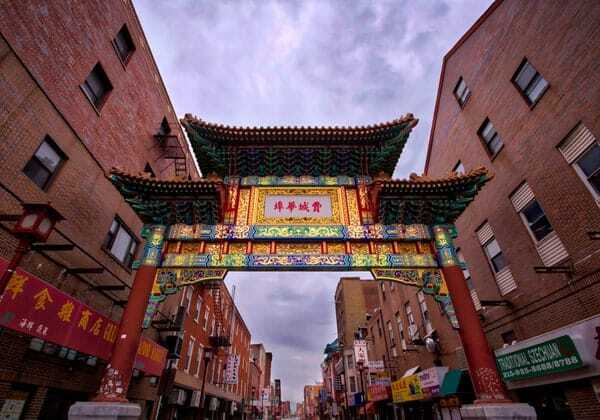 Stroll through Philly’s beautiful and fascinating Chinatown. 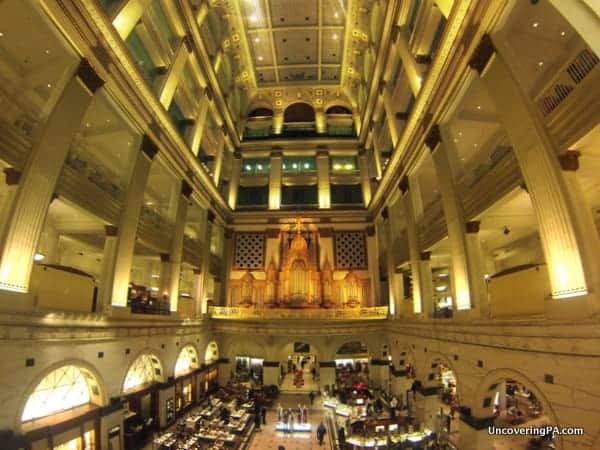 Second Bank of the United States – The building that was once home to the 2nd Bank of the United States is now an art gallery that features an exhibit called the “People of Independence”. Featuring over 180 portraits of Revolutionary War soldiers, politicians, scientists, and many more, the exhibit gives visitors a great chance to learn about many of the lesser-known people who shaped American Independence. More information can be found on the National Park Service’s website. Check Out Philly’s Squares – When William Penn founded Philadelphia, he created a grid system designed to give the city many parks and public squares. And, while development may have thwarted some of his plans, Philadelphia still has many great parks and squares. Whether you are looking to people watch, go for a walk, or for a place for the kids to play, there’s a great public square for you in downtown Philadelphia. 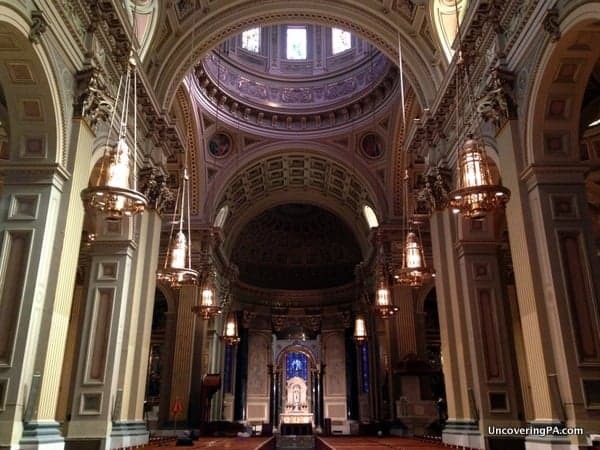 Cathedral Basilica of Saints Peter and Paul – Located on Logan Square is one of America’s most beautiful churches: the Cathedral Basilica of Saints Peter and Paul. The exterior of the building might look a bit drab, despite being the largest brownstone building in the city, but the interior is absolutely breathtaking. For those looking to learn more about the building, their website offers a free audio tour that you can download. Click here to read my full review of the basilica. The beautiful interior of the Cathedral Basilica of Saints Peter and Paul. The Schuylkill Center for Environmental Education – Designed to be an “island of green,” The Schuylkill Center for Environmental Education is one of the country’s first urban environmental education centers. The museum’s 400 acres include several miles of hiking trails, a children’s museum, seasonal butterfly house, and an art gallery. More information can be found on their website. Philadelphia Center for Architecture – The Philadelphia Center for Architecture is the city’s hub for architects, and it features a rotating collection of free exhibitions. While the exhibitions do loosely relate to architecture, they cover a range of subjects that should interest most. Currently on display is a collection of vintage neon signs, beautiful photos of Philadelphia’s most stunning buildings, and a scale model of the city. Click here for more information about visiting. Laurel Hill Cemetery – Visiting a cemetery might sound strange, but Laurel Hill Cemetery is more of an outdoor art gallery than a cemetery, at least as far as its living visitors are concerned. As one of the few cemeteries in America to be named a National Historic Site, it’s a great place to admire the lengths some will go to to be remembered after their deaths, and there are also many influential people buried in the cemetery. More information can be found in my full article on the cemetery. Self-Guided Philadelphia in the Movies Tour – Want to see where some of your favorite movies were filmed? This self-guided tour from Discover Philadelphia is perfect! Featuring the locations of movies such as The Sixth Sense, Silver Linings Playbook, Trading Places, Philadelphia, and many more, this walking/driving tour will take you around to some places that might already look very familiar to movie buffs. Click here to find out more information about this free, self-guided tour. Pizza Brain – Home to the Guinness Book of World Records-certified largest collection of pizza memorabilia and collectables in the world, Pizza Brain isn’t your normal pizzeria. The museum has a little bit of everything including a collection of music about pizza, pizza-related toys, and even a pizza cutter shaped like the USS Enterprise from Star Trek. Unfortunately, pizza isn’t free when you inevitably get hungry, but the museum costs nothing to check out. Visit their website for more information. The beautiful Wannamaker Organ in the center of Macy’s Department Store. Wissahickon Environmental Center – The Wissahickon Environmental Center is another of the city’s great public outdoor spaces. The center features several miles of hiking and walking trails, especially good for bird watchers. The environmental center building is open during the week, but is often filled with school groups during the year. When it’s open to the pubic, there’s a children’s library, a 200-gallon aquarium, and other events (some of which have a small fee). For more information about visiting, click here. Joseph Fox Bookshop – Every city needs a great independent bookstore, and Philadelphia has Joseph Fox Bookshop. Since 1951, this store has been providing one of the best bookstore environments in the area. Browsing through the racks and racks of books is sure to inspire. Buy something if you want, but browsing and inspiration is free. Visit their website here. 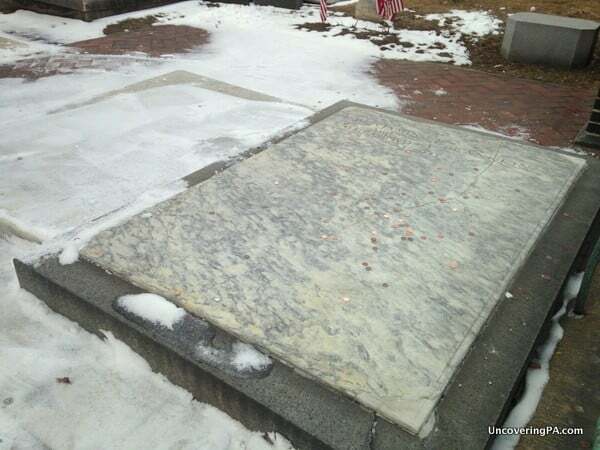 Benjamin Franklin’s Grave – In some senses, Benjamin Franklin’s grave isn’t free to visit. However, for those looking to quickly pay their respects and move on, there’s no reason to pay the admission fee to enter the cemetery. Located in the corner closest to the Constitution Center, Benjamin Franklin’s grave sits right next to the cemetery’s fence (so close that you could probably touch it if you want). While there are many interesting people buried in the cemetery, there’s no need to pay if you only want to see Franklin’s grave. Benjamin Franklin’s Grave as seen from the sidewalk outside the cemetery. Dr. and Mrs. Edwin Weaver III Historical Dental Museum – Part of the Temple School of Dentistry, the Dr. and Mrs. Edwin Weaver III Historical Dental Museum features a collection of antique dental equipment that has been mostly donated by the school’s alumni and faculty. If you think going to the dentist is bad in the 21st-century, you should see what it used to be like. Visit their website for more information. Declaration House – Many visitors to Philadelphia stop by Independence Hall to see where the Declaration of Independence was ratified, but few visit the nearby Declaration House. It was here, during the summer of 1775, that Thomas Jefferson wrote the draft of the famous document. The house is now set up as a museum to tell more about Jefferson’s time in the home. Click here for more information. 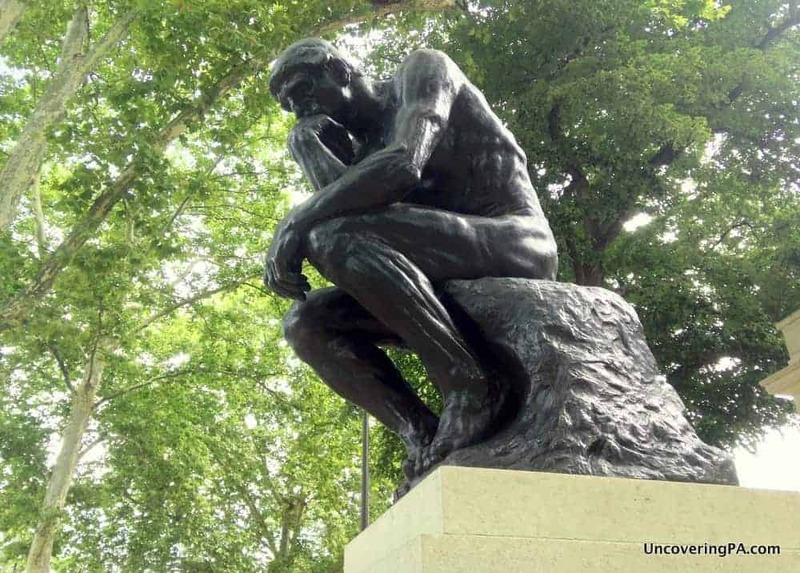 The Thinker Statue and Rodin Museum Garden – The Rodin Museum is one of Philadelphia’s best art museums. And, while it costs to get inside, many of the museum’s best pieces sit outside. The most recognizable piece is a cast of “The Thinker” that sits outside the museum’s gates along Benjamin Franklin Parkway. The garden area outside the museum is also free to visit during museum hours and features another handful of beautiful sculptures from French artist, Auguste Rodin. Visit their website here. The Thinker by Rodin outside the Rodin Museum in Philadelphia, Pennsylvania. Philadelphia’s War Memorials – While small war memorials dot the city, two of the largest and most well done are located near Penn’s Landing. The two memorials honor those from Philadelphia who lost their lives in the Korean War and the Vietnam War. The monuments sit next to each other and honor the more than 1,200 soldiers from the Philadelphia area that lost their lives in these two conflicts. For more information on visiting, check out the websites for the Korean War Memorial and Vietnam War Memorial. Free Outdoor Movie Screenings – During the summer months, multiple venues set up large screens and host free outdoor movies. Some of the movies are a bit old, but some are newer, and most are great films for the whole family. Here’s a list to give you an idea what was offered during the summer of 2014, but simply do a Google search to find the current listing of movies and locations. The Comcast Experience HD Video Wall – Located in the lobby of the Comcast Center in downtown Philly is the Comcast Experience. 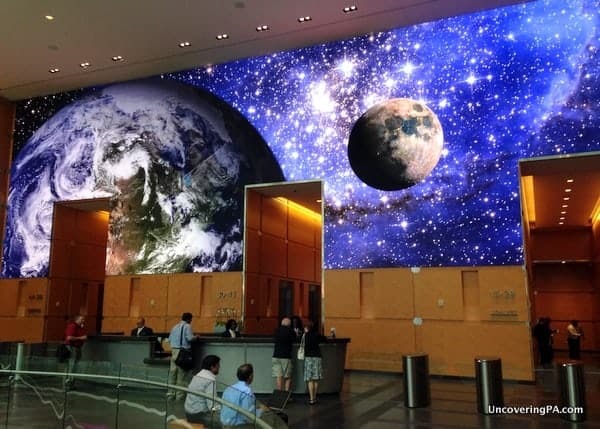 The screen is the largest four-millimeter LED screen in the world. At over 2,100-square feet, the screen’s clarity is something that has to be seen to be believed. Video programming is shown 18-hours a day, but the most popular time to come is during the Christmas season. More information can be found here. The Comcast Experience HD Video Wall. Gloria Dei Church – Gloria Dei Church, also known as Old Swedes, is a National Historic Site in south Philadelphia. Having held its first service in July 1700, it is the oldest church in the city and still functions as a place of worship. Visitors can take a free tour of this church to learn about its history and connection to the city. Find out more about the church in our article about the most interesting churches in Philadelphia. Visit the Graves of Baseball Hall of Famers – There are two Baseball Hall of Famers buried within the city limits of Philadelphia (Harry Kalas and Louis Santop), along with another five that are buried just outside the city limits. For baseball fans, visiting these graves is a great way to learn about the history of the sport. For more information, check out our articles about the hall of famers buried in North Philly and those buried in South Philly. Philadelphia’s Skateparks – There are eight free skate parks in Philadelphia that offer a chance for skateboarders to get out and enjoy the beauty of the city in a well-designed space. For more information, check out this site. The exterior of Gloria Dei Church in South Philly. Boathouse Row – Visitors traveling into Philly from the west often drive by the beautiful Boathouse Row along the banks of the Schuylkill River. All 15 boathouses are over 100 years old and are still home to rowing clubs and other boating facilities. While the boathouses are unfortunately closed to the public, the buildings are unique enough to make a walk past them a worthwhile activity for anyone looking for something free to do in Philly. Franklin Court – Franklin Court stands on the grounds where Benjamin Franklin’s Philadelphia home once stood. The excellent Benjamin Franklin Museum costs money to enter, but the courtyard is free. Inside the courtyard, you’ll find a metal frame that stands where Franklin’s house once stood. Several glass boxes allow you to peer down to the foundations of the old home. The printing office is also worth checking out. Park Service employees regularly operate the machinery and print out period manuscripts. More information about visiting can be found here. Waterfalls near Philly – If you are looking for great waterfalls near Philadelphia, we’ve put together a list of some of the closest falls to the city. Do you know any more free things to do in Philadelphia? Let us know in the comments below. Great list! 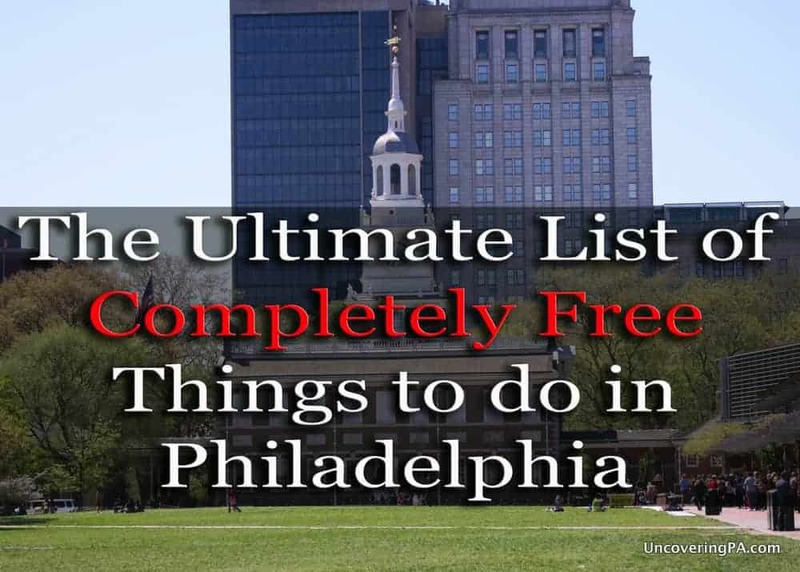 I may use this as my free Philadelphia bucket list! On Sundays, the Philadelphia Art Museum is free! (excluding the special exhibits!) Donations accepted, but none required! That is true, Kylie, but since it’s “Pay What You Wish” and not actually free, I didn’t include it. Everything on this list is advertised as completely free. I believed they changed that…I think it’s now the first Tues. of the month…I remember taking my kids between 11 and 1 on Sunday when it was free. Great list. Now I just need to get busy and start seeing some of these great things. Very nice piece about things to see in Philidelphia. Thanks, Marsha! It was fun to put together such a complete list of free things to do in Philadelphia. Yes – the Dream Garden sits in obscurity in the lobby of the Curtis Center ! But this helps to enlighten folks – and if they can’t visit they can see it in M. Night Shyamalan’s 2000 movie Unbreakable – he uses it as a backdrop in a romantic restaurant scene with Bruce Willis and Robin Wright Penn. Jim, I like the list but is there some way to map the stops on google ? I don’t have a map of the places, Tony. That’s a good idea though. I’ll think about putting something together at some point. One of the most fascinating museums that I visited in Philadelphia is the Waterworks (located behind and down from Art Gallery on the river). A good part of it was free and so interesting. People forget that Phila. was the most populous city in America in 1800 and the first to pipe water to homes. It shows the original wooden pipes (hollowed out logs) and diagrams of the original system. Engineers came from all over the world to study it. That sounds really interesting, Gail. It’s amazing how many free things there are to do in Philly! A friend and I want to explore these and check out her connections with family history. I am writing a children’s book set in Colonial times to present day. Other than that,food/beverage..it a free! If you’ve never played before all you will need your first few times is a mid range disc or a putter. And there are usually discs for sale in the afternoons. I have been throwing for 8 years, have played hundreds of Disc Golf courses the east coast to CA and Hawaii. Sedgley is a truly unique course, that will make you forget you’re in city limits. You will see a community of individuals, united by the disc, always willing to help a New thrower. 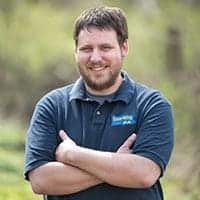 A series of individuals that ranges from the young to the old, of all walks of life, from all parts of the greater Philadelphia area and beyond. From the banker to the union worker, the student to the homeless, the hipster to hippie, to the every-man, woman, child, dog….it doesn’t matter, all that matters is that everyone is smiling, forgetting their daily worries and having fun. Fairmount Park is full of awesome places to go for free and make your own fun. No other city park has more to offer, even with very little imagination…you will find yourself exploring and having fun, reminded that your in Philadelphia, only when the majestic skyline presents itself in your adventures. Now you need to make us a list of where to park free in Philly! Great list. Good advice about Ben Franklin’s grave, though my husband and I paid to tour since it helps upkeep. We ways looked for the free and have fond memories of Philly free …just a walk along the pier, around South Street or through City Hall was a treat. HEADHOUSE MARKET SUNDAY MORNINGS 10-2 MAY-DEC.!!!!!! At the Pennsylvania Hospital at 8th St, ask to see the Operating Thester & Library. There is a cell phone tour of the great stuff there, and it’s free M-F.
Great list Jim! Many places I enjoy…Wanted to just add to as to have folks enjoy our urban haunts …North Philly -Stephen Girard “America’s First Tycoon” left us a great gift -The college his estate created has a museum in Founder’s Hall – Free Tours on Thursdays- Mrs. Laurent is great! While in the area,also visit The Wagner Free Institute of Science… Ask about Free Adult classes … Connection ,William Wagner worked for Stephen Girard and was one of his closest proteges…Near by is Temple University Paley Library Urban Archives are available to view for Free ! Park, just take a walk…ala Philly Girl, Jill Scott Free!!! Thanks Jim ! Whoops! Thanks for pointing that out, Pat. It’s been changed. I am sure you get lots of these comments, but don’t forget the Fairmount Waterworks Interpretive Center. Free, great exhibits, and a fascinating look into the history of Philadelphia, and its water provision. Thanks for the suggestion, Ray. I’m always looking for more free things to do in Philly. Hoping to expand on this list one day. You’ll never look at the sky again in the same way. Somewhere I read about a garden boasting a variety of treehouses, playhouses throughout the grounds for children, but haven’t been able to locate it ever since. I believe it was in or around the Philadelphia area. Does anyone have an idea what I might be talking about? Probably Longwood Gardens in Kennett Square, Chester County. It’s not free, but does have tree houses and some play areas. If you are looking for free playgrounds in Philly, Smith Memorial Playground is listed above and supposed to be great. You may be thinking of the Morris Arboretum in Chestnut Hill. Maybe the Tyler Arboretum in Media. Great list. Coming in May for our visit. Hope to include many of these places. Thanks for the heads up! I hope you enjoy your visit and have a chance to check out many of the great free things to do in Philly. Great list. Looking for things to do with family… Money is tight. Also the Shrine of St. Rita de Cascia on Broad Street. Breathtaking and contemplative, all in one. Am saving this list, as I’ve visited some of the locations, but definitely want to go back to see more as I’ve been visiting Philadelphia half of my life. Thanks for mentioning this. Looks like a great free thing to do in Philadelphia. I’ll have to check it out sometime. Excellent list! Many of these I’ve visited and many more I didn’t know about and look forward to visiting. The Federal Reserve Bank of Philadelphia, next to the Constitution Center, has a free hands-on exhibit. Plus, you get a bag of shredded $ and can exchange quarters for the most recently minted ones. The mint tour is on the list. Definitely a great tour, though I don’t believe they do free bags of shredded money unless they’ve added that recently.